Tagline for the world's worst movie, "The Thurmanator": In the Year of Darkness, 2029, the rulers of Buffalo devised the ultimate plan. They would reshape the future by changing the past. The plan required something that would never fumble, stumble or miss a chip block. Something that could score from anywhere on the field. 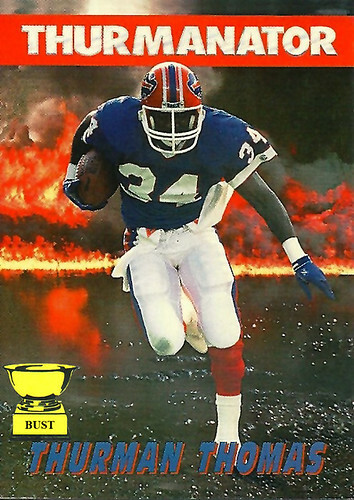 Something that, for once, would bring a Super Bowl title to Buffalo. Of course, that isn't really possible, so instead they created The Thurmanator, bringer of AFC championships and loser of helmets at crucial moments.